Lados is a transdermal analgesic electro stimulator with three operating modes that is compact, easy to use and highly effective. The therapeutic effect is based on dynamic electro and neurostimulation method. It helps to reduce pain and fights the reasons causing pain syndrome, relieves pathologic muscle strain, promotes blood circulation, improves the condition of intervertebral discs and articular cartilage. Quick analgesic effect in case of injuries (bruises, sprains, fractures, capsular ligamentous apparatus injuries). Pain management in case of mixed arthritis, degenerative disc disease. Joint mobility improvement. 3 operating modes 1. Universal pain treatment:Long-lasting analgesic effect at any stage of musculoskeletal disorders. 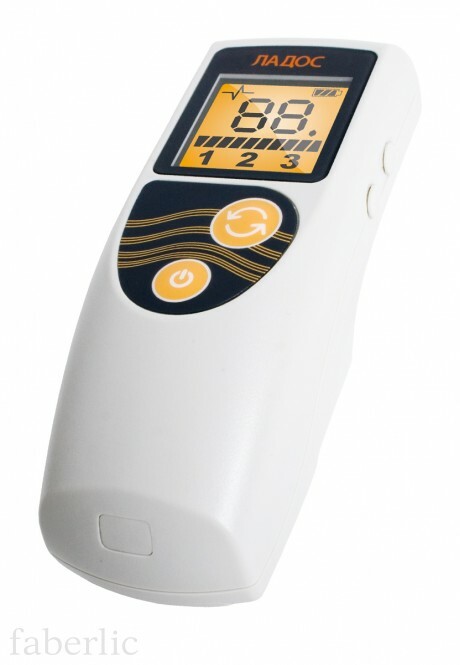 It is recommended to use the stimulator whenever necessary in case of periodic pain and arrange treatment courses of various duration in case of chronic pain. 2. Quick analgesic effect: Instant pain relieve and emergency aid in case of injuries or exacerbations. It is recommended to use the stimulator directly on the injured area immediately after the injury or around the wound in case the skin is damaged. 3. Miostimulation: motor function recoveryImproving mobility and muscle tone. It is recommended to use the stimulator during post-traumatic rehabilitation or in combination with therapeutic exercise. Helps to prevent blood congestion, improves lymph flow. Please study the user’s guide or consult a specialist for proper treatment and optimum combination with other therapeutic methods.